According to the New York Times, struggling bookmonger Barnes & Noble might be about to shelve its Nook. The problem is one more common to physical books than tablets: nobody's buying them. "They are not completely getting out of the hardware business, but they are going to lean a lot more on the comprehensive digital catalog of content," said this person, who asked not to be identified discussing corporate strategy. 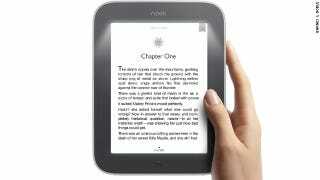 "To be clear, we have no plans to discontinue our award-winning line of NOOK products." Which is certainly in line with the NYT report; not discontinuing still leaves plenty of room for paring down.